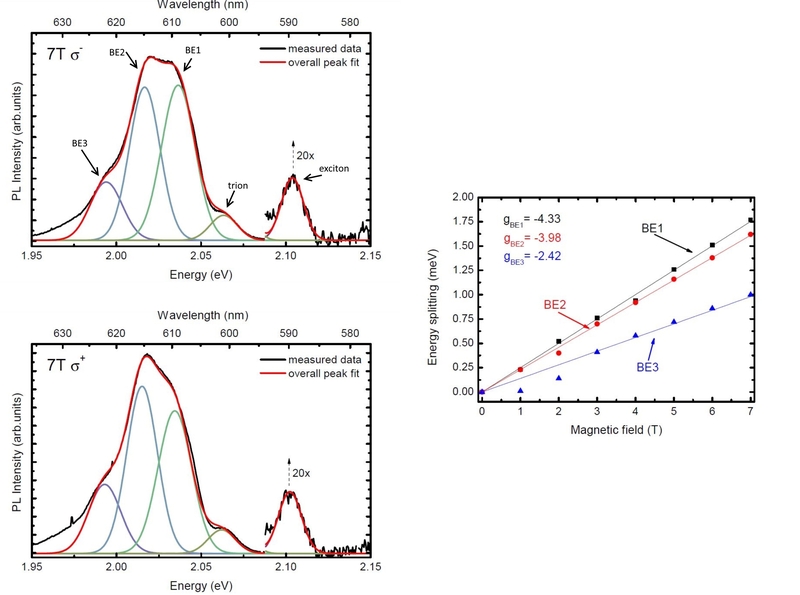 In a recent Journal of Physics: Condensed Matter Letter, Jan Kuhnert, Arash Rahimi-Iman and Wolfram Heimbrodt investigate photoluminescence of WS2 and the effect of applying an external magnetic field. Read on to find out more in the authors’ own words. Transition metal dichalcogenides (TMDCs) are the semiconducting alternative to graphene. They have attracted a huge interest within the last few years due to their outstanding physical and optical properties that lead to promising applications in the fields of photonics, valleytronics, field-effect transistors, gas sensors, to name but a few. In the bulk phase TMDCs are indirect semiconductors, but by thinning them down to monolayers analogously to graphene, TMDCs exhibit a direct band gap which makes them highly attractive and accessible to optical investigations such as photoluminescence measurements. The most popular representatives are MoS2, MoSe2, WS2, and WSe2. Due to the monolayer thickness the inversion symmetry of the crystal is broken and spin and valley are coupled to each other. The degeneracy between the two equivalent valleys, K and K’, respectively, can be lifted by applying an external magnetic field. 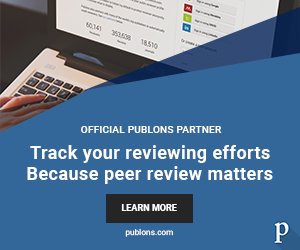 In our work [Jan Kuhnert et al 2017 J. Phys. : Condens. Matter 29 08LT02] we focused on WS2 that was grown via vapour phase deposition (CVD) on a silicon substrate covered with silicon oxide which is the more technological way of producing monolayers of TMDCs compared to the most common “scotch-tape method” where monolayers are produced by mechanical exfoliation of bulk crystals. The sample was excited using green laser light (532nm) and the emitted photoluminescence of the sample was detected in a circular polarized basis so that it could be distinguished from which valley (K or K’) the photoluminescence arose. Figure 1: Photoluminescence spectra measured for WS2 monolayers on silicon dioxide substrate with applied magnetic field of 7 Tesla, detected in σ+ and σ- polarization. The extracted g-factors for the bound exciton states (BE1-BE3) are shown on the right side. By applying an external magnetic field (up to 7 Tesla) that is provided by a super-conductive liquid helium cooled magnet the degeneracy between the K and K’ is broken and a splitting of the photoluminescence peaks can be observed. From this splitting for the first time the g-factors for each excitonic species in WS2 can be determined. For the free exciton and the trion we find a g-factor that is equal to 4 which could also be expected from a simple two band tight-binding model picture. For the three bound exciton states we get slightly different g-factors (4.33, 3.98, and 2.42) that show a clear trend: the higher the binding energy of the exciton the lower the corresponding g-factor. Lower emission energies of the defect-bound excitons are due to larger binding energies, which are most likely neutral or ionized donor or acceptor states. Larger binding energies and respective stronger localization of the excitons yield obviously smaller g-values. We attribute these changes to different valley-orbital contributions to the magnetic moments of the conduction and valence band. The magneto-optical studies were jointly carried out by M.Sc. 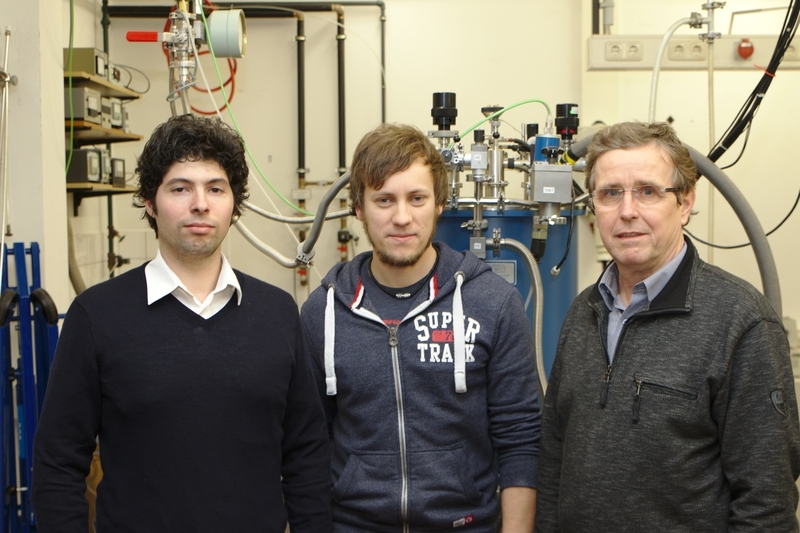 Jan Kuhnert, Dr Arash Rahimi-Iman, and Professor Dr Wolfram Heimbrodt of the work group ‘experimental semiconductor physics’ at the Department of Physics and Materials Sciences Center of the Philipps-University of Marburg. Figure 1 taken from Jan Kuhnert et al 2017 J. Phys. : Condens. Matter 29 08LT02. Copyright IOP Publishing 2017. All rights reserved. Author photo courtesy of Jan Kuhnert.